Brown, Columbia, Cornell, Dartmouth, Princeton, Yale. Harvard football’s current crop of seniors has defeated each of these teams at least once during its tenure in Cambridge. One Ivy foe is conspicuously absent from that list: Penn. In 2015, Penn spoiled the Crimson’s bid for an undefeated season by marching into Harvard Stadium and outscoring the home team, 14-0, in the second half to pull away with a 35-25 victory. The next year, Harvard traveled to Philadelphia and lost by 13 in a Friday night showdown. Last season, the Quakers further increased their margin of victory with a 23-6 triumph. This year, Harvard (4-4, 2-3 Ivy) again hits the road to take on Penn (6-2, 3-2). The Quakers have pieced together three separate two-game win streaks this season, broken up by losses to Dartmouth and Yale. Penn looks to continue its recent winning ways, while Harvard aims to break a three-year stretch of futility against its southernmost Ivy foe. Aside from conference juggernauts Princeton and Dartmouth, Penn has by far the lowest scoring defense among the remaining Ivy teams. The Quakers have allowed an average of 17.3 points per game and only once has an opponent posted 30 or more points (Dartmouth, 37). Additionally, Penn has only conceded two touchdowns across its last two games combined. All three levels of this Saturday’s host’s defense are formidable. Up front, the Quakers boast a unit that leads the league by a considerable margin in sacks (29). Last season, Nick Miller was named a first-team All-Ivy linebacker. In the secondary, Penn has accumulated eight interceptions, tied with Harvard. Harvard and Penn are somewhat similar teams in construction and philosophy. 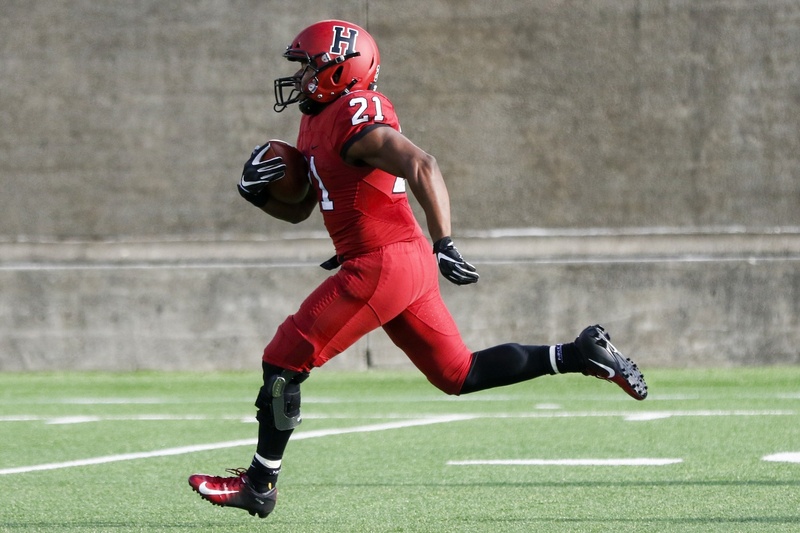 Harvard prides itself on its defense and Murphy believes that the defense paves the way for the team’s overall success, a sentiment that Quakers coach Ray Priore would likely echo. “Whether it’s Alabama, whether it’s Clemson, whether it’s Harvard, whether it’s Penn, it all starts with defense and we really, really believe in how important that is in recruiting, in development, and in emphasis,” Murphy said. Penn’s offense, while not as fearsome at a mere 20.6 points per game, could still cause Harvard some trouble. It plays a very traditional style predicated upon the run game and short passes. Senior defensive tackle Richie Ryan notes that he and his fellow linemen may have their work cut out for them due to the Quakers’ tendency to read the defensive tackles and make a call based on their positioning and movements. “They want to run it down your throat and they want to play hard-nosed, old-school football, so I like it,” Ryan said. Noticeably absent from Penn’s offensive attack this time around is wide receiver Justin Watson. Watson, now with the Tampa Bay Buccaneers, was a menace against the Crimson. In the three most recent matchups between Harvard and Penn, the wideout racked up 317 receiving yards and four touchdowns. Most notable was his performance in the Quakers’ 35-25 win in 2015 — the then-sophomore tallied 249 total yards on just five carries and seven receptions and also found the end zone twice. This time around, the ground attack will likely be more prominent for Priore and his offense. Led by junior Karekin Brooks, the Penn backfield is averaging 196.3 rushing yards per contest. Brooks is responsible for 107.6 of those on average, and he has also scored eight times. Harvard has lost more frequently on the road in recent memory, but its string of road conquests would have been hard for any team to maintain, as it had a 16-game winning streak as the visiting team broken during the 2016 campaign. Murphy and his players still keep up the “road warrior” mentality, and that attitude will be crucial as the Crimson prepares for its final away game of 2018.